2015 was a year of big gestures in the the global game of arts patronage. On an ever grander scale the urban space was shaped by private commissions from leading architects: in May Fondazione Prada, designed by Rem Koolhaas, opened in Milan; in June Garage Museum, also by Koolhaas, relaunched by Russian entrepreneur Dasha Zhukova in Moscow. 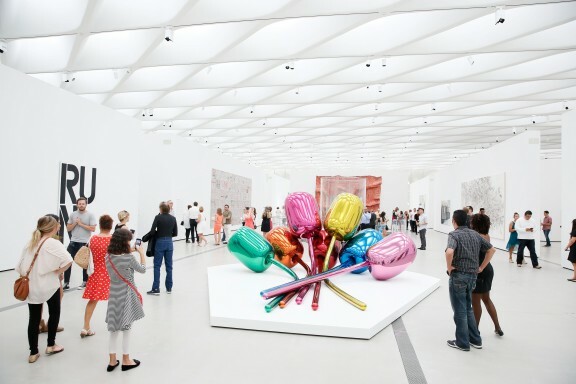 Then the Broad in Downtown LA opened in September and Damien Hirst’s Newport Street Gallery in London in October. In LA billionaire collector Eli Broad is one of the most influential figures in matters of city planning and culture, his strong hold is compared to the Medicis. When Gehry’s Disney Hall was in trouble in the 1980’s, Mr Broad came to rescue. The completed concert hall became a landmark building and an icon for the city. Across the road from Disney Hall, together with his wife Edythe, Eli Broad started plans for setting up house for their personal collection and adding an extra cultural layer to the LA Downtown area. Designed by Diller, Scofidio + Renfro the new museum is a box-like structure next to Gehry’s complex forms. Visually the form recalls an amplifier, and literally it’s multiplying the cultural value of the area. Now LA is competing with New York as the new art mecca. artists are relocating, discovering cheaper and better studio spaces. The Broad is both a storage and an exhibition space. The museum plays with transparency and brings views into the private side (where art works are handled) and glimpses into the operations behind such a collection. It also employs a team of experts who can guide you through the works on show, which is a novel and generous idea in the museum experience – the Broads have been attentive to the needs of a wider public. Entrance is free and pre-booked tickets are now sold out several weeks ahead. In London arts patrons have had less of an impact on urban developments until now, as the area around Vauxhall, south of the Thames, has received some much needed cultural buzz. The Victorian warehouses acquired by Damien Hirst, over ten years ago, are now beautifully converted with three new structures by architects Caruso St John. Behind the high rise complexes popping up along the Thames, Hirst’s new gallery space is elegant and classic. It is a welcome addition to this corner. Beaconsfield Gallery down the road was the first contemporary art space there. Some critics were disappointed by the subdued nature of the inaugural show and even the architecture. But the gallery itself, occupying an entire block with a restaurant and a shop, is a grand gesture for London and its cultural life. It’s also a reflection of the political situation and the role and the ambitions of the patron. Hirst’s exhibition space can accommodate large works, like a museum. Collectors and cultural flâneurs are wandering to Vauxhall, which also has great restaurants and cafes opening in the area. In Moscow Dasha Zhukova decided to relocate the Garage (initially launched in a historic Melnikov building) into a more central position in the Gorky Park. As a strategy is was different from what local patrons in Milan, London and LA were doing, but in a political and social context of Russia urban renewal is a different process. You certainly wouldn’t find a vast derelict restaurant building in central London. Koolhaas, who was commissioned to recreate the space, described it a ‘wreck’. Once again Koolhaas was happy to play around the existing building, without the need to come up with new spectacular shapes. Now the 1960’s building, clad with a translucent façade, is home to Zhukova’s arts and education programme. It brings a contemporary edge to the urban experience in Moscow and invigorates a dialogue on art and architecture in the heart of the city. Private patrons are shaping the cities with an unprecedented force. And it’s not just money pouring in from the Gulf states that’s changing London, or branded institutions that have been investing in the cultural offerings of big cities. It’s good to see the urban space defined and changes delivered by individuals driven by cultural ambitions.